Since forming in 2002, Dutch electro-rockers Nemesea - fronted by the comely Manda Ophuis - have been diligently carving out a place for themselves among the rising stars of the commercialized Goth metal scene. With Manda's superb vocals, an almost overpowering keyboard presence, and tunes crafted specifically for modern rock radio, Nemesea's third album The Quiet Resistance is on par with recent releases from stylistic compatriots Lacuna Coil, Evanescence, and UnSun. Taken for what it is, The Quiet Resistance is a fine example of infectious pop-metal that will undoubtedly snare rock radio zealots with hooky melodies, Manda's impassioned vocals, and lush keyboard arrangements that often relegate Henrik Jan (HJ) de Jong's riffs to a supporting role. That's an unfortunate aspect of the album, from a metal point of view, since the guitar presence is quite interesting when given the spotlight. Still, songs like "Caught in the Middle" and "Afterlife" have a way of inserting themselves into your memory with refrains that are anything but forgettable. Considering that The Quiet Resistance is being released in the waning months of 2011, Nemesea commits a bit of a rock faux pas by drawing on some passé trends - namely turntable scratches. "Say" is the first song to embrace this dated element, offering them up briefly as perhaps a grounding contrast to some rather nice synth accents. "It's Over" goes full nu-metal , however, as Bulletproof Messenger's Matt Litwin provides the scratches while his bandmate Marcus Klavan takes over the microphone. The song does feature a nice solo from HJ, but not enough to legitimize the overall atmosphere. The Quiet Resistance is unquestionably most engaging when Nemesea keeps the pace mid-tempo and above, but the band has a propensity for slowing things down for songs that I respectfully call "chick rock". Essentially ballads with a touch of crunch, these tracks would not be at all out of place in the next installment of The Princess Diaries franchise. "If You Could" and "I Live" fall squarely into the ballad category, as does "High Enough". The latter song features a guest vocal appearance from Delain's Charlotte Wessels, who lends her capable skills to Manda's already endearing performance. While much of the album is devoted to merging with the mainstream, Nemesea does reach back to their electro-rock roots to keep The Quiet Resistance from becoming too consistent. The intro track and "2012" are pretty much fillers, with digitally enhanced spoken-word lyrics and synthesized background noise. "Rush", with a disarmingly mellow industrial sound, resembles something Björk would have released in her Post period, while the Casio beats of "Release Me" are straight out of the '80s. One of the album's highlights, particularly from a metal perspective, is the closing track "Allein". A Goth/electro/industrial hybrid straight out of a Rammstein fetish party, the song features Heli Reissenweber of the Rammstein tribute band Stahlzeit delivering the German-language lyrics. A nice finishing touch. 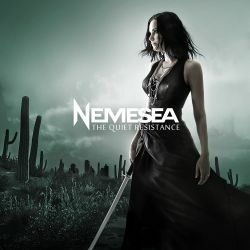 Acknowledging that The Quiet Resistance is an album tailor-made for contemporary rock radio masses, there's no argument that Nemesea have put together a collection of songs that will please their target demographic. With a talented singer like Manda fronting the band, though, Nemesea could easily rival bands like Tristania, Stream of Passion and Sirenia for attention from metal fans should they choose such a direction. Maybe next time.